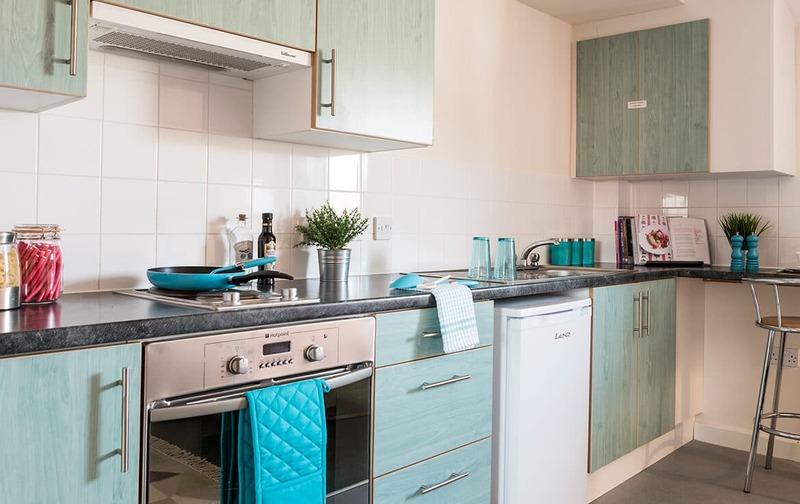 Close to the city centre, our Point Exe property is well-situated for any budding student ready to experience the uni lifestyle (and study hard of course). Not only can you walk to the University of Exeter, you’ll also live between two railway stations, making for easy transport to and from your friends and family if you’re feeling homesick. During term time you could also catch the free shuttle bus from Exeter St David’s train station to both campuses. When you’ve got free time, you can make the most of your proximity to the Princesshay shopping centre with over 70 stores, take a bus ride to the exciting Crealy theme park or take a bike ride along the stunning River Exe and make use of our practical bike storage. Explore the high-quality Studio Rooms available at our Point Exe property, Exeter. You'll find the perfect balance between independent living & socialising! What types of accommodation are available in Exeter? We offer all-inclusive studio rooms to give you just the right amount of independence. If you don’t want to share living and kitchen areas – perhaps you’d rather leave the flat to socialise only when you feel like it – Point Exe could be just perfect. These studios are designed to feel bright, light and spacious so you can get the most out of studying and our residential activities will give you plenty of opportunity to get to know your neighbours too. Whether you’ve been for a long revision session in the library or out late on student night, you can look forward to coming home to a comfortable bed, a convenient study set-up and plenty of shelving to help you get organised for a day at uni. With no one else’s dishes to clean and the freedom to invite your new friends over to get your socialising fix, Point Exe will be the memorable starting point of your university journey. All bills are included in the weekly price for your peace of mind. This means that your water, electric and contents insurance costs will never give you a shock at the end of the month! Whether you are streaming your favourite TV show or doing some in-depth research for an assignment, your Wi-Fi will always be on-hand too. Point Exe also offers an on-site parcel service, nearby shops and a laundry room for all your daily needs. Our 24-hour security/support means that you can feel safe and secure whether it’s day or night, so you can have the best student experience possible.